Billy's younger neighbor, Tommy, loves to ride Blaze. But he wants a pony of his own--a real one, not just another toy pony. 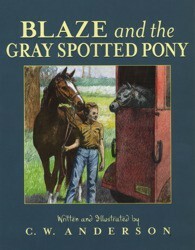 Then one glorious day, with a little help from Billy and Blaze, Tommy finds the gray spotted pony of his dreams. Ages 5-8. Paperback. 32 pages.